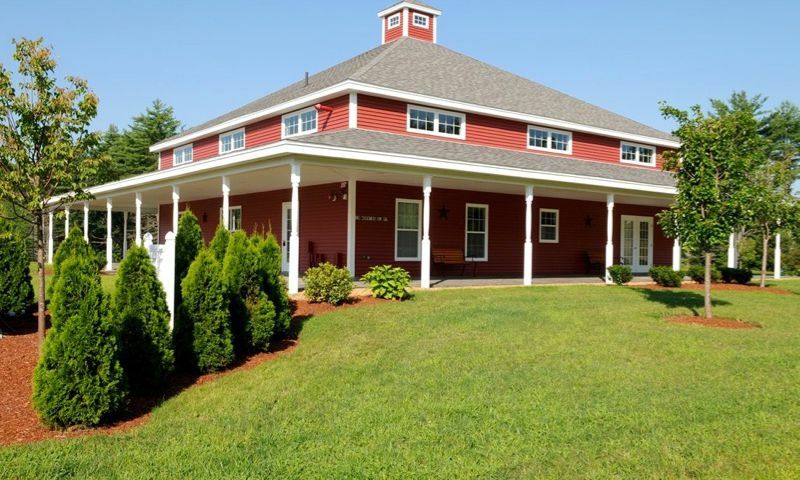 Villages at Loudon is a 55+ community in Loudon, New Hampshire. This active adult neighborhood will consist of just 100 low-maintenance single-family homes, making it ideal for neighbors to bond over shared interests. A charming clubhouse is the focal point of the community and allows residents to get together for any occasion. Located close to the state's capital of Concord, this community makes it easy for homeowners to access major roadways as well as options for shopping, dining, and recreation. Homeowners can stay active, fit, and social at the community's 2,500 square-foot clubhouse. Here, they can maintain a health regimen by utilizing the equipment in the exercise room. A multi-purpose room, which has a sitting area and catering kitchen, is perfect for small or large functions that bring neighbors together to socialize in a friendly and welcoming setting. Residents enjoy the beautiful outdoors with plenty of parks and natural space to get some fresh air. They can also spend their time lounging on the patio or watching a scenic sunset. Construction of Villages at Loudon began in 2010 by MDP Development LLC. This age-restricted community consists of 100 detached homes that range in size from about 1,050 to 1,750 square feet. Homebuyers can choose from five distinct floor plans that can be customized to fit their style and budget. Single-family homes have two bedrooms, one to two-and-a-half bathrooms, and an attached one or two-car garage. They have beautiful interior finishes, open layouts, granite kitchen countertops, full basements, and low-maintenance exteriors. The Grand Villager model is the largest home in the community and features a second-floor bonus room. Residents enjoy a maintenance-free lifestyle in this 55+ neighborhood. Thanks to an established homeowners' association (HOA) fee taking care of exterior home maintenance, snow removal, and lawn care, active adults can do as they please in their leisure time. They can get together with neighbors in the clubhouse, catch up on a new novel, start their own club, or learn a new hobby with other like-minded adults in this vibrant community. Ideally situated in Merrimack County, residents enjoy a quiet and tranquil setting as well as daily conveniences nearby. Just outside of the community are fast food restaurants and cafes, small shops, the Loudon Recreational Fields, and Soucook River State Forest. A bit farther are major roadways like Highway 202 and Interstate 393 for driving around town quickly. Concord, which is the capital of New Hampshire, is 13 minutes away and offers plenty of retail shops, restaurants, and attractions. Steeplegate Mall includes a Sam's Club, Best Buy, The Home Depot, Target, Starbucks, Applebee's, Olive Garden, and a movie theater. For big-city entertainment, Manchester is a 30-minute drive that makes for a great day trip. Residents can enjoy a game of golf at Derryfield Country Club or spend time outdoors at several parks in the area. They can also visit the Currier Museum of Art for a bit of culture. When traveling farther is necessary, Manchester-Boston Regional Airport is nearby. Villages at Loudon is an ideal 55+ community set within a beautiful, natural setting in Southern New Hampshire. Check back soon for more information on the lifestyle in Villages at Loudon. Construction of Villages at Loudon began in 2010 by MDP Development LLC. This age-restricted community consists of 100 detached homes that range in size from about 1,050 to 1,750 square feet. Homebuyers can choose from five distinct floor plans that can be customized to fit their style and budget. Single-family homes have two bedrooms, one to two-and-a-half bathrooms, and an attached one or two-car garage. They have beautiful interior finishes, open layouts, granite kitchen countertops, full basements, and low-maintenance exteriors. The Grand Villager model is the largest home in the community and features a second-floor bonus room. Please Note: Not all floor plans are available at this time. 55places.com is not affiliated with the developer(s) or homeowners association of Villages at Loudon. The information you submit is distributed to a 55places.com Partner Agent, who is a licensed real estate agent. The information regarding Villages at Loudon has not been verified or approved by the developer or homeowners association. Please verify all information prior to purchasing. 55places.com is not responsible for any errors regarding the information displayed on this website.